Recently, I got the opportunity to visit Al Schoffelman in Tea, South Dakota to check out his Wood Ford Truck creation. Built out of Red Oak, Al spent years working on his custom, drive-able truck. Every inch of this truck is immaculate with the amazing craftsmanship and attention to detail. 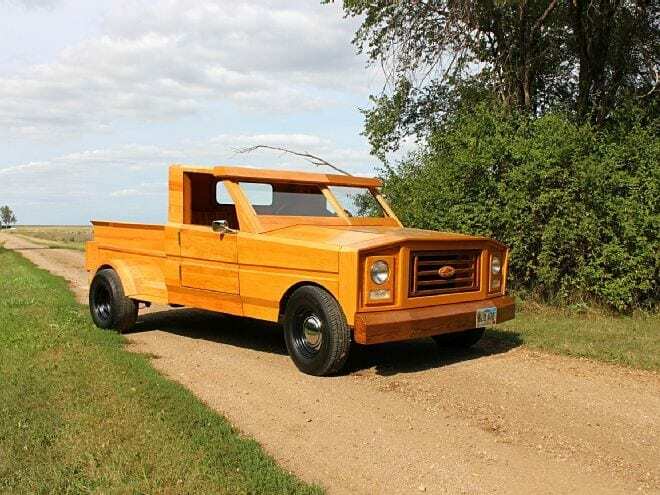 I found out about this truck through the Under the Hood show, a popular car-talk radio show, when Russ Evans, a host on the show, uploaded a video after his wife told him to check out this amazing wood truck. Fortunately, I saw it and consequently would be heading sort of through his area in the next month. As things in life often do, the timing was just perfect and things just worked out. Spending the afternoon with Al and checking out both this wood Ford truck as well as his immaculate Ford F-150 show truck really helped break up the 20+ hour road trip I was on. His wife and him were friendly and welcoming to this weary traveler. There are so many different things about this story to write about, I had to pick and choose what I wanted to cover. You can read the entire story on how and why he built it is on Truck Trend.com and will be in a spring edition of the printed magazine. Plus, I was able to ride in the truck and hear it run. With apologies for the portrait angle of the video, here is my video of the wood Ford truck running and driving. And here is the video that started it all from the Under the Hood show. These stories don’t come around every day and I’m so pleased I got the chance to tell it. Al’s work and his creation should be shared with every truck enthusiast who has ever said, “I think I can do it better.” Al did. Can you?